Inanimate Objects » What is the “wrap and shape” method? What is the “wrap and shape” method? 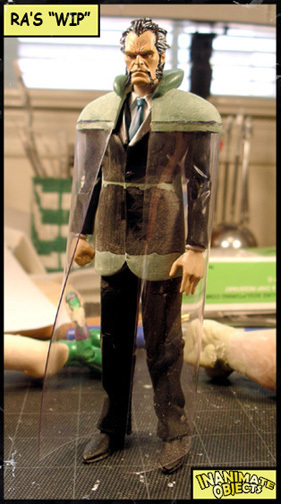 “Wrap and shape” is the technique by which one wraps a figure in a protective layer, such as cellophane, and then adds and shapes a sculpting medium on top. The cured sculpt can then be easily removed from the figure, and the protective layer discarded. This is a great method to create over-the-shoulder capes and mantles. See Classic Ra’s al Ghul and Batman in the gallery.